With a sleek and retro design, the small but mighty X-T100 boasts outstanding image quality thanks to its 24.2-megapixel sensor, combined with Fujifilm’s signature colour reproduction technology. Featuring advanced automatic scene recognition, three-way tilting touch screen, and the latest Bluetooth technology, it’s the ultimate everyday photographic companion. Fujifilm is delighted to announce that it will launch the Fujifilm X-T100, the latest exciting addition to the X Series of premium mirrorless digital cameras on 24th May 2018. Sporting a sleek, retro and stylish design, it offers a host of features including a high magnification electronic viewfinder, a horizontal tilting rear LCD screen, and an extended battery life of up to 430 frames. The small but mighty X-T100 weighs just 448g with an anodized coated aluminium top cover, it delivers a retro look yet luxury feel. The powerful 24.2-megapixel APS-C size sensor is 14 times bigger than the sensor inside a conventional smartphone and using the latest built-in Bluetooth technology makes image transfer quick and easy for sharing with friends. Anodized coating offers a retro and stylish design in a variety of colours. Combined with Fujifilm’s iconic colour reproduction technology that has been refined over 80 years, the camera is the perfect companion for a broad range of shooting opportunities. The X-T100 offers a variety of body colours such as Dark Silver, Black, and Champagne Gold and follows the familiar design of the popular X-T series from Fujifilm, offering three control dials on the top cover. The X-T100 combines a 24.2-megapixel APS-C sensor with the image processing engine to achieve Fujifilm’s renowned photo quality. Combined with the supplied Fujinon lens, the camera boasts ultimate image resolution, lowlight capability, wide dynamic range, and outstanding colour reproduction. Compatible with Fujifilm’s iconic and respected X Mount lens line-up and featuring three-way tilting LCD monitor, an electronic viewfinder, and powerful battery. The 26 lenses of Fujifilm’s extensive lens line-up covers a vast focal length from 15mm to 1200mm (35mm equivalent) including zoom and prime lenses. 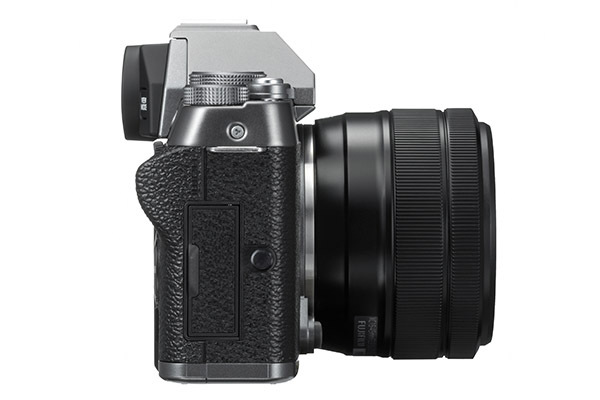 In combination with newly introduced three-way tilting LCD monitor, high resolution and high magnification (0.62x) organic EL electronic viewfinder, and powerful battery capable of 430 frames per charge, the X-T100 is versatile, reliable and the ideal companion for executing creativity. The Bluetooth low energy technology has been incorporated for quick, easy and automatic transfer of still images to paired smartphones and tablet devices, using the free smart-device app, Fujifilm Camera Remote. The seamless transfer function provides constant image transfer even while in shooting mode, so images can be shared and uploaded at a moments’ notice. The camera is also compatible with Fujifilm Instax SP-3 printer, so users can enjoy the fun of printing and sharing their images more than ever before. The X-T100 offers 11 variations of Fujifilm’s unique Film Simulation Modes and 17 variations of Advanced Filters, making adding advanced artistic flair easy with the reproduction of film-like colour tones and artistic expression.